New Formalism developed in the mid-1950s and continued into the early 1970s. It was a reaction against the rigid formulae of the American version of the International Style. Its three main architects - Edward Durrell Stone, Philip Johnson, and Minoru Yamasaki - had all achieved prominence working within the International Style but wanted to try new styles and materials. New Formalism architecture combines decorative elements and established design concepts of classicism with the new materials and technologies incorporated in the International style. Edward Durrell Stone's New Delhi American Embassy (1954), which blended the architecture of the east with modern western concepts, is considered to be the start of New Formalism architecture. The style was used primarily for high profile cultural, institutional and civic buildings, including the Los Angeles Music Center and the Century Plaza Hotel in Los Angeles, the Ambassador Auditorium in Pasadena, the Lincoln Center for the Performing Arts in New York City, and Edward Durrell Stone's Kennedy Center for the Performing Arts in Washington, D.C. 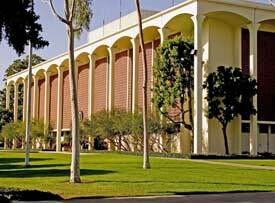 In Southern California, the style was applied mainly to museums, auditoriums, and college campuses. 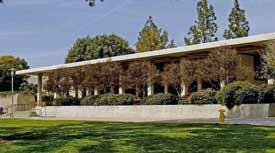 The University of Southern California, the California Institute of Technology, and Harvey Mudd College in Claremont all have significant buildings of the New Formalism style, designed by different architectural firms. Other local examples of New Formalism include the Ahmanson Center in Los Angeles and the Ambassador Auditorium in Pasadena. There are a couple of buildings in Fullerton that are designed in the New Formalism style. 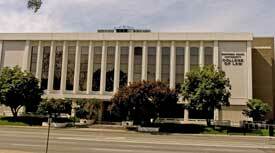 The present Fullerton City Hall (1963) at 303 W. Commonwealth Avenue is probably the best example of the style in Fullerton, although the type of materials used for the building is comparatively modest. A second building exhibiting features of this style is the Western State University College of Law (1975) at 1111 N. State College Boulevard. "Edward Durell Stone." Architects on Architecture. New York: Walker and Company, 1966: 173-183. Fox, Stephen. The Architecture of Philip Johnson. Boston: Bulfinch Press, 2002. Jacobus, John M. Philip Johnson. New York: Braziller, 1962. Stone, Edward Durell. Recent & Future Architecture. New York: Horizon Press, 1967. Yamasaki, Minoru. A Life in Architecture.New York: Weatherhill, 1979.